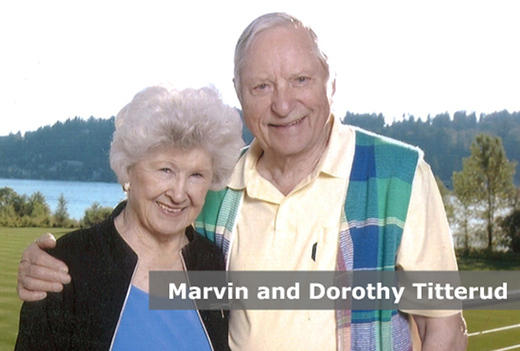 In honor of the excellent care he has received and to help Virginia Mason achieve its mission of improving patients’ health and well-being, Marv and his late wife Dorothy have donated since 2001. “I feel fortunate to be able to give regularly and also help Virginia Mason when they have a particular need,” he explains. The Titteruds supported the capital campaign for Virginia Mason's hospital addition, the Floyd & Delores Jones Pavilion, and Marv is a Chairman’s Society member, donating annually to Transforming Healthcare. In 2016, he gave a gift to honor Dr. Larson, his primary care provider. “The Puget Sound region can be very proud of Virginia Mason,” says Marv. “Not everybody is in a position to be able to give, so I try to support the organizations that I care about, that help the community and that do great work.” Marv grew up in North Dakota and eventually moved to Washington state. He went from farming to selling life insurance to building a successful business owning a number of Midas Muffler franchises. His wife Dorothy passed away last year, but Marv remains active reading, being involved in his church, and keeping in touch with friends. Virginia Mason counts on Marv and donors like him to help provide remarkable care for patients and their families every day.